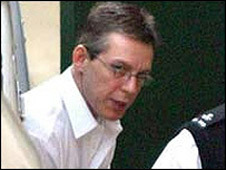 Appeal court judges have told killer Jeremy Bamber the "extreme gravity of the offences" he committed justified their decision he should die in jail. Bamber was convicted of murdering his adoptive parents, his sister and her six-year-old twin sons at their home in Tolleshunt D'Arcy, Essex, in 1985. Last month Bamber's appeal to reduce the full life sentence to 25 years was rejected by three Appeal Court judges. They said there was "no basis" for interfering with the original ruling. Following an earlier appeal by Bamber, High Court judge Mr Justice Tugendhat ruled last May that the "whole-life" tariff, imposed in the case in 1988 by the then Home Secretary, must remain on the basis the murders were "exceptionally serious". Bamber, now 48, was found guilty in 1986 of shooting his wealthy adoptive parents, June and Nevill, his sister Sheila Caffell, and her six-year-old twin sons Daniel and Nicholas. On Thursday Lord Chief Justice Lord Judge, Mr Justice David Clarke and Mr Justice Wyn Williams gave reasons for dismissing Bamber's application for permission to appeal against the tariff. Lord Judge said the occasions when a whole life order should be made should be reserved for the "most extreme cases". "We were asked to consider a number of decisions where a whole life order was not made, or was quashed on appeal, notwithstanding the extreme gravity of the offences. "Our concern, however, is with this particular sentence. "We can see no possible basis for interfering with Mr Justice Tugendhat's decision. "It was neither wrong in principle nor did it produce a manifestly excessive result. "We would, however, and unusually, go further. On conviction of these crimes, even when committed by a relatively young man, punishment and retribution in the form of a whole life order was fully justified."